Six would-be cosmonauts have entered a sealed facility where they will spend 18 months with no windows and only e-mail contact with the outside world. 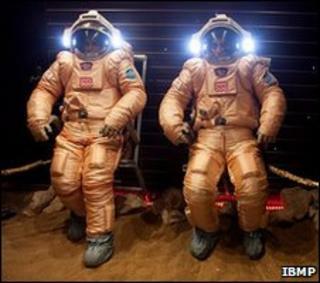 The men are taking part in the Mars500 project, which aims to simulate a mission to Mars. They entered the craft, located at a medical institute in Moscow, just before 1100 BST on Thursday. Scientists say the study will help them understand how humans would cope on a long journey to another world. During a press conference on Thursday morning, the six men - three Russians, two Europeans and a Chinese man - all described what motivated them to take part in the experiment. Twenty-six year old Wang Yue from China, the youngest of the volunteers, said he was excited to be involved in a project that he felt would be "excellent for science and for all of humankind". French volunteer Romain Charles acknowledged that it would be a "difficult" mission and said that he would miss his family and "the Sun and fresh air". The project has been designed to be as realistic as possible even though some elements - such as the weightless conditions of spaceflight - cannot be recreated here on Earth. "They will have to cope with limited consumables, for example," said Dr Martin Zell from the European Space Agency, a key partner in the project. "That means everything will be onboard at the start. There will be no re-load, re-supply whatsoever. It will be like a real mission." LANDING MODULE: This will only be used during the 30-day landing operation. Three crewmembers will visit the "surface"
The craft is based at Moscow's Institute of Biomedical Problems and comprises a series of interconnected steel canisters. The total interior volume is about 550 cubic metres. Image caption Near a hundred experiments will be performed during the "journey"
Four of the tubes provide the living and working environment on the "journey" to and from Mars. Their interior has been decorated with wood panelling to give the cylinders a more homely feel. A fifth module is a mock-up of the Red Planet itself, an enclosed room with a floor covered in rocks and sand. About half-way through the mission, three of the crew will have to "land" on this "surface" and walk about on it while dressed in heavy space suits. The "cosmonauts" will be commanded by 38-year-old marine engineer and astronaut trainer Alexey Sitev, who has only recently been married. His compatriots - Sukhrob Kamolov (32) and Alexander Smoleevskiy (33) - have medical backgrounds. The two Europeans in the group - Diego Urbina (27) and Romain Charles (31) - are engineers by training. Wang Yue has a "day job" training Chinese astronauts. Colombian-Italian Diego Urbina said his motivation came from his desire to work in space research. "I'm also very interested in being a part of the story of getting humans to Mars," he told BBC News. "When the very first human steps on Mars, I will be able to say, 'yeah, I helped do that'. That will make me feel very proud." Scientific investigations during the experiment will assess the effect that isolation has on various psychological and physiological aspects such as stress, hormone levels, sleep quality, mood and the benefits of dietary supplements. Dr Berna van Baarsen, from the Free University Medical Center, Amsterdam, Holland, is a principal investigator on Mars500. "We expect Mars500 to have Earth applications, in understanding group dynamics connected to isolation and loneliness, for example," she said. "I hope it will also help us understand better some groups, such as those elderly people who are isolated in their homes. It should tell us about coping behaviours." The spaceship itself will come under scrutiny, also, as the crew monitor their surroundings to see which types of bacteria take hold and thrive in the enclosed space. All of the results of these investigations will have to be emailed to "mission control" as the organisers of the project intend to introduce a 20-minute, one-way time-delay in communications to mirror the real lag in sending messages over the vast distance between Mars and Earth. "Everything will be done in a telemedicine environment, where the crew has to do the analysis and we receive the data by telemetry," said Dr Zell, who heads up Europe's space station utilisation programme. This 520-day mock mission with its 30 days of "surface operations" is the final phase of the three-part Mars500 project. There have already been two smaller studies, one lasting 14 days and another taking 105 days to complete. Space agencies describe Mars as the "ultimate destination" for human explorers. However, they do not possess the technology to complete such an endeavour and are unlikely have it for many years yet. Will we ever send humans to Mars?